The 2019 Nigerian Presidential debate – what we learnt from the third way candidates. This blog is the first of a 3-part series on Nigeria’s 2019 Presidential debate, the next will feature President, Muhammadu Buhari of the All Progressives Congress (APC) and his strongest challenger, Atiku Abubakar of the People’s Democratic Party (PDP). On Saturday the 19th of January, the Presidential debate in Nigeria was held with only 3 of the 5 top contenders showing up. The other two, the incumbent President and his closest contender, Atiku Abubakar were a no-show. Atiku did show up but once it was clear that the President would not be participating, he backed out last minute (make of that what you will). I do not want to focus this blog on how disappointing it was that these two men stood Nigerians up, but I hope a time comes when there would be political consequences for those who refuse to participate in these debates. 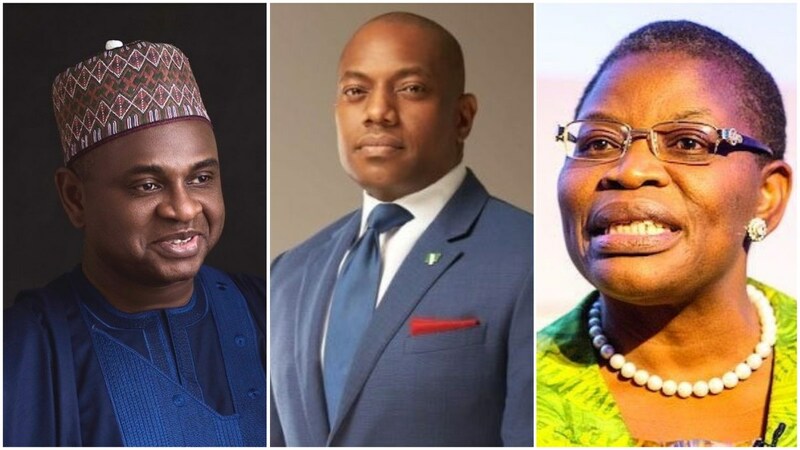 The purpose of today’s blog, however, is to examine the policies of those who did show up – Kingsley Moghalu of the Young Progressives Party (YPP); Oby Ezekwesili of the Allied Congress Party of Nigeria (ACPN) and Fela Durotoye of the Alliance for a New Nigeria (ANN). The three main areas I would focus on are: the economy, education and women’s empowerment – simply because these are my top three electoral issues 😊 Their positions on these issues come from their presentations at the debate as well as their manifestos/policy documents. No point talking about how badly the economy is doing but if the sluggish 1.8% GDP growth rate and 8, 300, 000 million youth who have lost their jobs lost in the last 3 years are indices to go by, then it is pretty clear that this should be the number one priority of whoever wins the 2019 Presidential elections. From her policy document, Project Rescue Nigeria, Oby’s position on the economy is very clearly articulated – she is advocating for less government intervention in the economy and a private-sector led approach. Oby reiterated this position in the debate where she says that her focus would be on raising the productivity of Nigerians. Her thesis is that the over 50% of Nigerians who live on less than N700 per day are poor because they are engaged in unproductive activities, therefore she believes that raising their productivity, will increase their earning potential and lift them out of poverty – her goal is to lift 80 million Nigerians out of poverty. To achieve this, she says she will promote government policies that raise productivity and remove the regulatory barriers to formalisation, seeing that many of the poor are in the informal sector. Oby’s commitment to private sector led growth is also evident in her view of social safety nets, she believes that whilst they may be necessary for the poorest and most vulnerable, they must only be a negligible complement to the core agenda of a private sector led growth. I really like this to be honest, it explains why I am not a huge fan of this government’s expansive N- power and Trader Moni initiatives; China did not lift 300 million people out of poverty through social programmes but rather by boosting the private sector and creating jobs. With Fela Durotoye, it is not clear what his underlying economic philosophy is – private-sector, state-led or mixed. At the debate, he says he would focus on building the non-oil sector with his three most important sectors being agriculture, housing and road construction. He believes that fixing infrastructure and increasing agricultural land use from 35% to 50% would create 30 million jobs. Fela also said he would return agriculture commodity boards, I am curious as to why he finds this appealing given that these boards were hotbeds of corruption. His policy document, The Big Agenda, is not helpful either, his economic plan there focuses on improving the ease of doing business; national planning and tax reforms. These are important issues no doubt, but they do not fully capture the range of structural economic issues in the economy. I found it quite odd that a priority of his is to create a single public sector job portal to track public sector jobs and performance. It goes without saying that the public sector should have a record of every job it creates but that ‘public sector jobs’ is a priority to him is quite unsettling. Anyone familiar with how the modern economy works know that the private sector is the engine of job creation in any economy and if we are going to prioritise job creation, it should be ‘private-sector job. Kingsley Moghalu makes a powerful point that we must fix politics before fixing the economy, I agree with this assertion as bad politics often undermine good economics. While saying that Nigeria would have to decide whether it is a capitalist or socialist country, he does not explicitly state his own position. While I agree with the spirit of the statement, I am not a huge fan of ideological extremes, so I am not sure if we should choose either of them or apply pragmatism in combining the best of both. His plan is to equip young people with skills by reforming the education system; provide them with capital through a $1 trillion venture capital fund – all of which he believes would fix the economy and foster industrialisation. According to his manifesto, he says his intention is to create an innovation-driven economy through appropriate laws and policies. To achieve this, he intends to overhaul the current economic management and establish a council of economic advisers. He plans to develop an economic diversification plan akin to Saudi Arabia’s diversification plan. As a former Minister of Education, I was keen on hearing Oby’s plan for the sector. At the debate, she said that her focus would be on employability and the provision of relevant skills and making the education curriculum more dynamic, she plans to conduct a comprehensive reform of education curriculum at primary, secondary and tertiary levels. She also says that there is a need to retrain teachers to improve their quality. Her signature Get-A-Skills programme for young people would be implemented in concert with the private sector. Oby plans to reduce the number of out-of-school children by 20% annually, from 13.2 million to 5.4 million by 2023. Fela’s plan is to engage the private sector in the development of the education curriculum as he claims that the current system does not adequately prepare students to be employable. He also talked about the need to instil the right values and work ethics in students. He says he will work towards greater specialisation of teachers so that they are subject matter experts in what they teach. He says his administration would invest in infrastructure and learning environment and work with alumni networks to meet the financing needs of schools..Ermm, which alumni sir? Kingsley says that he would muster the political will to ensure that not less than 20% of the budget is allocated to education. He also lamented that 80% of the current education budget is spent on recurrent expenditure and he intends to change that. He says he would retrain and recertify teachers and ensure that graduates have entrepreneurial and vocational skills. He plans to reform the pedagogy, make secondary school free and put an end to ASSU strikes. Oga Kingsley, please how do you intend to fund this free secondary school education??? I must admit that it was disappointing that none of these candidates had a comprehensive and well thought out plan that addresses the needs of women and girls. Many of what they said were the usual talking points, that do not sufficiently show how they plan to mainstream women issues across all government policies, laws and institutions – this to me should be the core of the government’s intervention in gender issues. Fela Durotoye was quick to say how his ‘beautiful and delectable’ (I kid you not…he said that on live TV) female running mate had done a lot of work with women, therefore they would prioritise it. His policy document does not even help, he lumps women into a section titled ‘women, youth and masses’ (I really hate it when people lump women and youth – such infantilization of women!) Literally his plans for women are; ‘Inclusion of ‘women, youths and the masses in every policy’ and ‘Make Nigeria one of the best countries in the world for women’. What do these even mean? As for Oby Ezekwesili, she has no section in her policy document focused on women and girls, for someone who has been on the forefront of the BBOG campaign, I found that rather odd and disappointing too. The only reference to women there is that she would support those in mining and agriculture and that her cabinet would be gender balanced. At the debate however, she said she would provide incentives to send girls to school and incentives for girls to want to go to school. She said she would also focus on raising the productivity of parents of girls especially mothers, as the more income households have, the less likely they are to withdraw their girls from school. I expected her to provide a more comprehensive and ambitious plan for women, to be honest. Kingsley Moghalu says he would make education free for women, ensure young women have access to finance and end early marriages. In his manifesto, he plans to combat violence against women, ensure 50:50 gender parity in political appointments and promote the role of men in ensuring gender equality….the usual talking points. Overall, I commend the organisers and participants of the debate, I thought it was well organised. To me, Kingsley Moghalu performed best, closely followed by Oby Ezekwesili. These third-way candidates provide us with a glimpse into the quality of political discourse we can have if we manage to get our act together. Did you watch the debate? What did you think of their performance and policies? Do you think it would affect the electoral outcomes? What did you think of Buhari and Atiku’s no-show? Previous How to get into a top graduate programme – my Oxford experience! !